Proper gutter cleaning must be done at least once a year to avoid clogging of the gutters and downpipes. Ashlee House Cleaning can provide you with efficient and quality guaranteed gutter cleaning. The gutter cleaners are ready to use the professional dry or wet vacuum cleaners and telescopic poles to reach to any rubbish. Small cameras attached to the poles' end allow the cleaners to see and remove all twigs, leaves and other waste. You will be provided with before and after photos of the condition of your gutter and downpipes. We offer our clients a quality guarantee of one month for the service. Ourwindow cleaning service is deep cleaning of windows, using purified squeegee for internal window cleaning method and water and fed pole cleaning for external window cleaning. 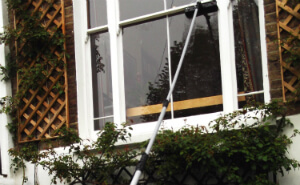 Our deep and thorough Wormholt and White City W3 domestic window cleaning service involves not only secured window cleaning, but also cleaning of almost all frames, if PVC, wiping of all sills, if reachable, too. We guarantee fast result and insurance in case of any omission. Key pick-up and delivery can be arranged, in case you have no chance to stay in the property throughout the process. Almost all kind of domestic properties are accepted. We have skilled roof cleaners who could efficiently eliminate lichen, algae, mould, nasty stains and moss from roofs. We are a wanted for nearby house roof cleaning firm that can make sure that your rooftop looks nice and it's safe from deterioration caused by all the residues and hazardous clumps that get amassed on it. We use highly effective jet washing equipment for perfectly cleaned roofs. Ou prices are preset and quite reasonable. For effective and outdoor window, gutter or roof cleaning in the area - make a booking for our cleaning services right away! We have created a procedure for fast and easy reservations for our window cleaning Wormholt and White City W3 service. All you need to do is make contact with our customer care service at by calling 020 3746 1366 or using the online completing request form. Decide any day of the year for the cleaning. Our window cleaners could perform their job at predetermined and acceptable prices. We won't ask you for a a a downpayment. You will receive an email and SMS verifying your booking in the next Two hours. For booking more than 1 of our services at once, we will reward you with a price reduction of up to 15%.